devices for measuring the passage of time in seconds, minutes, and hours. Clocks and watches are classified as timepieces, which category also includes chronometers, timing devices, timers, time-delay relays, and combination devices, such as a watch combined with a stopwatch. Time can be measured by means of regular translatory motion, rotary motion, or periodic oscillations; the measure of time will be, respectively, the distance traveled, the angle of rotation, or the number of oscillations. The first device used by man to measure time was the sundial. The gnomon was already used as a primitive clock in the middle of the third millennium B.C. Time was reckoned by sundials with horizontal and vertical faces in ancient Egypt and Greece. Ulug Beg constructed a sundial approximately 50 m high in Samarkand in the first half of the 15th century. Clocks with vertical faces became common in Europe in the Middle Ages; examples have been preserved in Moscow, for example, on the building of the Institute of Historical Archives and the old building of Moscow State University. in the tank guaranteed a regular rate of filling of the vessel and an even rise in the water level, which was indicated by the scale. Circa 150 B.C., Ctesibius devised a water clock that became the prototype of timepieces used in many countries until the 18th century. Regular motion was the basis of operation of several other types of clocks, including the sand clock. The first reference to a mechanical clock is contained in a Byzantine anthology of the late sixth century A.D. Some historians ascribe the invention of the mechanical clock to Pacificus of Verona (early ninth century); others give credit to the monk Gerbert (later Pope Sylvester II), who is alleged to have made a weight-driven tower clock for the city of Magdeburg, Germany, in 966. This was not a mechanical clock in the modern sense, but rather a water clock that used mechanisms to drive auxiliary devices, such as the striking mechanism, but not to measure time. It is known with certainty that a mechanical tower clock of simple design was built in Milan in 1335. Between 1348 and 1364, Giovanni Dondi in Italy built a clock that, in addition to counting time, reproduced the motion of the sun, the moon, and five planets. In 1354 the clock of the cathedral of Strasburg was installed; it played music and had a calendar and moving figures. The first tower clock in Russia was built in the Moscow Kremlin in 1404 by the monk Lazarus the Serb. It was driven by weights and featured a striking device and a planetary movement. Tower clocks were installed in many Russian cities from the 15th to 17th centuries. 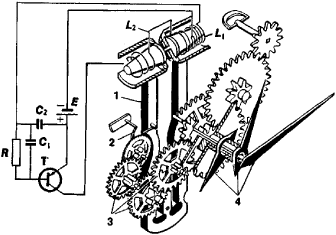 The first mechanical clock with a verge escapement appeared in the 14th century. In comparison with water clocks, the new clocks were an advance, but their precision was still no better than 30 min/day, and until the 16th century they had only a single hand. Circa 1510, P. Henlein of Nuremberg first used a steel spring in place of weights and built a pocket watch with a verge escapement. Because of imperfections in the springs and in the verge mechanism, which did not have a natural period of oscillation, the readings of the clocks depended largely on the degree to which the spring was wound. In 1525, J. Zech of Prague proposed the fusee, a device designed to even out the force of the spring over time, thus making it possible to improve the precision of clocks with mainsprings. Even though their precision was not of a high order, clocks with verge escapements were highly reliable and continued in use until the end of the 19th century. Galileo’s discovery of the isochronism of the small oscillations of a pendulum—that is, that the period of oscillation does not depend on the amplitude—was enormously important for improving the precision of clocks. Circa 1640, Galileo proposed a new escapement, which resembled that of the modern chronometer, but his idea was not put into practice. C. Huygens is rightly considered the inventor of the modern mechanical clock; he first used a pendulum as a clock regulator in 1657. Pendulum clocks, even with an imperfect verge escapement, could reduce the daily error to 5–10 sec. In 1675 the English clockmaker W. Clement proposed replacing the verge escapement with a pallet mechanism that was a primitive variation of the anchor, or recoil, escapement. This mechanism has been kept to the present day in simple wall clocks with pendulums. A new advance in clockmaking was made by the Englishman G. Graham, who invented the deadbeat escapement, which had a considerably smaller energy loss than Clement’s design. In 1675, Huygens proposed a spiral spring and balance to regulate oscillations. The balance is a wheel with a solid metal (usually brass) rim, secured on a steel spindle; one end of the thin spiral spring (hairspring) is secured to the spindle of the balance wheel, and the other is attached to a fixed support. When set in motion, the system oscillates about its axis; the balance wheel’s moment of inertia and the rigidity of the hairspring determine the system’s period of oscillation. Such an oscillatory system has a natural period of oscillation; it is sufficiently reliable for operation when a watch is worn or a clock is moved. The use of the balance regulator in spring-driven clocks demanded further improvements in escapements. Until the end of the 19th century, the cylinder escapement invented by Graham in the early 18th century was widely used in pocket watches. The detached lever escapement became widespread in the second half of the 19th century and has continued in use in all portable clocks, including wristwatches and pocket watches, to the present day. With the improved precision of clock mechanisms, minute hands were added to pocket watches in the late 17th century, and from circa 1760 second hands were added to clocks and watches. Changes in the temperature of the environment have a significant effect on the accurate running of pendulum clocks, especially those with balance mechanisms. Over a 24-hour period in which the temperature changes by 1°C, the change in the length of a steel pendulum causes an error of 0.5 sec, and the change in a wooden pendulum induces an error of 0.2 sec; the corresponding error is about 11 seconds for a clock with a balance mechanism and steel hairspring, caused primarily by changes in the spring’s rigidity. In the mid-18th century several types of pendulums were devised in which temperature error was compensated. The French clockmaker P. Leroy proposed the use of a bimetal to achieve temperature compensation of the balance regulator in 1761. Balances of this type with compensation weights on the rim are used in modern marine chronometers. In the late 18th century the Russian engineer I. P. Kulibin proposed an original design for a bimetallic balance. In the late 19th century and early 20th centuries, the Swiss physicist C. E. Guillaume invented Invar, an alloy with a coefficient of linear expansion close to zero (for pendulums), and elinvar, an alloy with a minimal coefficient of ther-moelasticity (for hairsprings). The use of the new alloys in clocks and watches in conjunction with compensation devices virtually eliminated the effect of temperature on the running of mechanical clocks. For example, even without a compensation device, a clock with an Invar pendulum has a temperature error of less than 0.05 sec per 24 hours per 1°C, and the corresponding error for a wristwatch with an elinvar hairspring is less than 0.5 sec. Such accuracy is entirely satisfactory for clocks and watches designed for general use. In 18th-century Russia the outstanding engineers Kulibin, T. I. Voloskov, and L. Sabakin worked on refinements of the clock, in particular, escapement design and methods of temperature compensation. Kulibin made a series of unique clocks. One example, preserved in the Hermitage, was in the form of an egg with figures that automatically performed intricate movements as the clock struck; another—a pocket planetary watch—had seven indicators showing the hour, minute, second, day of the week, month, phase of the moon, and sunrise and sunset. In 19th-century Russia the engineers D. I. Tolstoi and I. P. Nosov worked successfully on refinements of clocks and watches. The clockmaker brothers I. N. Butenop and N. N. Butenop completely modernized the musical clock of the Spasskaia Tower of the Moscow Kremlin in 1851 and 1852 (seeKREMLIN CHIMES). A somewhat arbitrary distinction is made between everyday and specialized clocks and watches, depending on the purpose of the timepiece. The former include wristwatches, pocket watches, table clocks, wall clocks, street clocks, and tower clocks, which differ in their conditions of use. Specialized clocks and watches include timepieces used underwater, traveling clocks, and anti-magnetic clocks. There is a large group of specialized work clocks, including signal clocks, portal time clocks, medical clocks, and program clocks. Modern clocks and watches are classified by type of oscillatory system as pendulum, balance, tuning fork, quartz-crystal, and quantum types. Because the oscillations in a clock may be maintained and readings given from different energy sources and by different methods, clocks and watches are also classified as mechanical, electric contact, electric contactless, and electronic (such as quartz-crystal watches with digital display by liquid crystals) types. AC clocks constitute a special category. They are classified as secondary timepieces; the role of the primary timepiece is played by the power plant generator. Conventional clocks may also serve as primary timepieces; they are usually highly accurate and transmit electric pulses to secondary clocks by wire every 30 or 60 sec. The most common clocks and watches are those driven mechanically by springs or weights. The principal units in a modern mechanical clock or watch (Figure 1) are a drive source, a system of gear wheels, an escapement, a regulator, the hand assembly, and a winding mechanism. A spring (the drive source) turns the barrel (1) in which it is located and through it a system of gear wheels (2, 3, 4, 5). The rate of rotation of the gear wheels depends on the period of oscillations in the balance-hairspring system (6, 7). The number of teeth on the gear wheels and the period of oscillation of the balance are so designed that one gear wheel (2) makes one rotation per hour and another gear wheel (4) makes one rotation per minute; the minute hand and second hand are connected, respectively, to the shafts of the two gear wheels. In practice, the minute hand is not directly connected to the shaft of the first gear wheel (2), but rather to a pinion (9), which makes it possible to shift the hand independently of the gear wheels (2, 3, 4, 5). 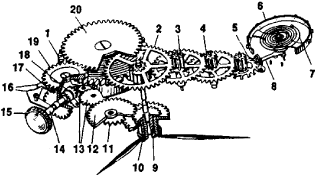 The first gear wheel (2), through a gear train (9, 11, 12), moves the hour wheel (10), to which the hour hand is attached. During winding, rotation of the winding button (15) is imparted through a shaft (14), a clutch (18), and gears (17, 19, 20) to the shaft on which the spring is wound. When the hands are to be shifted, the winding button (15) is drawn out, and the clutch (18) is moved away from the winding pinion (17) by means of the setting and clutch levers (16) and engaged with the setting wheels (13) that turn the hands. Modern clocks and watches frequently have an additional mechanism that indicates the date and the day of the week; large timepieces may also indicate the month. Wristwatches often have antishock devices to protect them from damage. Self-winding mechanical wristwatches are becoming more common. They have a free-swinging, unbalanced weight in the shape of a sector, which is mounted in the movement at the side of the case. While the watch is worn on the wrist, the weight oscillates and winds the spring through wheel gearing by means of a reversing device; in the course of 10–12 hours the spring is fully wound, which ensures that the watch will run for 20 hours or longer. The user is freed from the necessity of winding the watch, and, what is especially important, the watch is operated with a more constant force from the mainspring and consequently runs more accurately. Electrical devices were first tried in clocks in the 1830’s and 1840’s. Initially electric contact pendulum and balance-wheel clocks were wound by an electromagnet, electric motor, or similar device. The work of the Swiss clockmaker M. Hipp and the French clockmaker L. Breguet, who designed clocks with an electric drive, was of great importance to the future development of electric contact clocks. In clocks operated by an electric drive, the power supply to the drive is switched on periodically through contacts controlled by a pendulum or balance wheel so that self-excited oscillations are established in the escapement. The oscillatory system fulfills the function of a motor, its motion being converted by a special mechanism into intermittent rotary motion of the hands. Until the mid-1900’s, electric contact clocks were mainly large pendulum types and, occasionally, balance-wheel types. The advent of miniature contacts and small current sources having a high energy density led to the perfection of small models, particularly wristwatches. In the early 1950’s such watches were produced at the LIP factory in France and by the Hamilton Watch Company in the USA. Their electric circuit was completed through mechanical contacts when a pulse was fed to the balance wheel. The replacement of mechanical contacts by electronic switches in the form of transistors, tunnel diodes, and integrated circuits improved the reliability of electric watches. Such modern balance-wheel wristwatches have an accuracy of ±15 sec per day and consume approximately 10 microamperes of current from a source having a voltage of 1.3–1.5 volts. Such timepieces may be called contactless types to distinguish them from their predecessors. They have a traditional oscillatory system—either a pendulum or a balance wheel and hairspring. The high-speed response of electronic devices and the feasibility of controlling them at small oscillator amplitudes have motivated the development of tuning fork and quartz-crystal watches and clocks that are extremely accurate. During the 1970’s both wristwatches and table clocks that used tuning forks became popular. They operate on self-contained batteries that require replacement every one or two years, and they are accurate to ±2 sec per day. The first tuning fork regulator with a contact interrupter was devised in 1915 by H. Guye. In 1919, W. Eccles and F. W. Jordan of Great Britain and H. Abraham and E. Bloch of France proposed a vacuum-tube, tuning fork regulator circuit with an electromagnetic drive. Transistorized tuning fork regulators for wristwatches were first manufactured by the Bulova Watch Company of the USA in 1950; in the USSR tuning fork watches were first produced in 1962 at the Second Moscow Watch Factory. Such watches have a ratchet mechanism to convert vibrations from the tuning fork into rotary motion of the hands. One design for an electromagnetic, tuning fork clock is shown in Figure 2. When the tuning fork vibrates, an electromotive force is induced in the release winding that turns on the transistor, thereby causing current to flow from the power supply into the pulse winding. The vibration frequency of the tuning fork is 360 hertz. In electric contactless clocks and watches that have relatively high-frequency (of the order of 32-kilohertz) quartz-crystal oscillators, the electric pulses of the regulator may control the operation of a stepper or synchronous electric motor, or they may synchronize the operation of a DC motor. The control circuit consists of an electronic frequency divider, a pulse-shaping circuit, and amplifiers. Most quartz-crystal clocks and watches have a stepper motor. The running rate is adjusted by means of a trimming capacitor in the oscillator circuit. W. A. Marrison of Great Britain was the first to propose a circuit for a quartz-crystal clock (1929); in the late 1970’s such watches were produced by many firms, including Ebauches S. A. in Switzerland, Omega Watch Corporation and Hamilton Watch Company in the USA, and Seiko Time Corporation in Japan. The excellent temperature stability, high quality, and stable performance of quartz-crystal oscillators with respect to external dynamic influences ensures an accuracy of approximately 2 sec per day for small clocks designed for everyday use and of 0.001 sec per day for large high-precision types. Quartz-crystal wristwatches are now common as a result of the capabilities of modern, semiconductor production technology and the development of integrated circuits. The watches that have electronic circuitry and digital readout by means of liquid crystals or light-emitting diodes are called electronic watches. In addition to a quartz-crystal oscillator, the electronic portion of such watches includes a frequency divider (or counter) and decoders (Figure 3). In 1977 the USSR produced models with conventional hands and with digital displays. 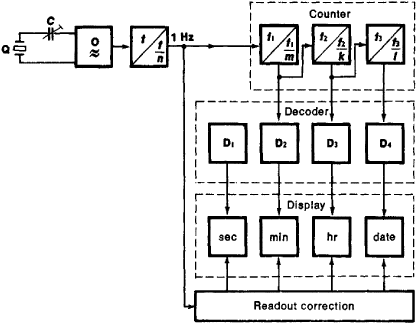 A common timing system is used to match the readings of a group of clocks. The system consists of high-precision primary clocks and groups of secondary clocks, which are connected through communication channels with the primary clocks. The primary clocks control the operation of the secondary clocks, which may be ordinary electric contact clocks or electric pulse counters. In order to improve the accuracy and reliability of a common timing system, the secondary clocks are often made to operate independently, and their rate is either corrected periodically or synchronized by accurate time signals from the primary clocks. Modern clocks and watches vary widely in accuracy, depending on the practical requirements of time measurement. For example, atomic clocks, used particularly for cosmic studies, have a relative error of approximately 10–13; high-precision pendulum clocks have an error of the order of 10–11; and quartz-crystal marine chronometers exhibit an error of approximately 10–8 (that is, the accuracy of their running is within several thousandths of a second per day). Quartz-crystal wristwatches have an accuracy of ±2 sec per day, and the tuning fork and balance-wheel electric contactless watches are accurate to within 15 sec per day. High-quality mechanical clocks designed for everyday use are accurate within 5 sec per day; those of average quality exhibit an error range between 30 and 60 sec per day. Mechanical alarm clocks exhibit an error ranging from 1 to 1.5 min per day. Aksel’rod, Z. M. Teorüa i proektirovanie priborov vremeni. Leningrad, 1969. Drozdov. F. V. Pribory vremeni. Moscow, 1940. Bautin, N. N. “Dinamicheskie modeli svobodnykh chasovykh khodov.” In Pamiati A. A. Andronova. Moscow, 1955. Shpolianskii, V. A., and B. M. Cherniagin. Elektricheskie pribory vremeni. Moscow, 1964. Konstantinov, A. I., and A. G. Fleer. Vremia. Moscow, 1971. Andrade, J. F. C. Horlogerie et Chronométrie. Paris, 1924. Defossez, L. Théorie générale d’horlogerie, vol. 1. La Chaux-de-Fonds, 1950. Haag, J. Les Mouvements vibratoires, vol. 1. Paris, 1952. Repairers usually specialise in either clocks and watches as different skills are required. By the 1970s, the electronic quartz watch became less expensive as well as more accurate than mechanical watches, resulting in much higher sales of such clocks and watches. Colorful photographs of clocks and watches are particularly interesting and may prompt children to look for these items in their home and community and compare them. com/research/f911c2/quarterly_report_o) has announced the addition of the "Quarterly Report on China's Import and Export of Clocks and Watches and Parts thereof, 2009Q2" subscription to their offering.